The GO-M04 generates an operator-paced output of 400 ft-lbs which can be increased 10X with an HD Pipe Extension. The WORKMASTER® GO-M04 Gate Opener is a manual-powered, hand portable, compact Railcar Gate Opener that utilizes a 1-1/2″ sq dr, extreme-duty, ratchet wrench to enable an operator to generate a no-torque reaction power output of 400 ft-lbs with its standard 36″ handle. The GO-M04 Railcar Gate Opener’s ratchet mechanism can accept up to 5,000 ft-lbs of input torque so the handle can be lengthened using a heavy walled 2″ ID pipe to increase the M04’s “breaker bar” power. Because the GO-M04 uses a 4-sided, tapered drive fitting to turn the capstan, the dangerous slippage problem that occurs using a pry bar is eliminate. The GO-M04 is the ideal Railcar Gate Opener when budget is limited and hopper car unloading is infrequent. 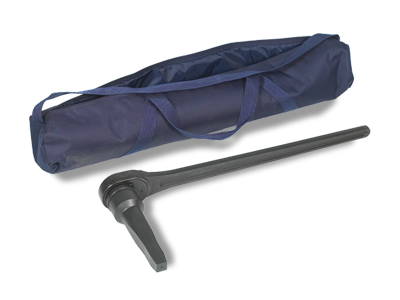 Tapered handle allows easy mounting of extension handle for a greater torque output. Heavy-Duty Ratchet capable of producing up to 5,000 ft-lbs. Facilitates steady, controlled gate opening without concern for wear of gate mechanism. Meets even the tightest budget when a lightweight, portable Gate Opener is required. Enables one worker to easily carry and position this 22 lb powerhouse and thereby improve safety, increase productivity, and reduce manpower planning. Accommodates noise restrictions at plant or unloading site operations.